It’s a fact that modern roundabouts produce challenges for implementation related to controversy caused by misconceptions, the inherent fear of the unknown, and other concerns regarding what effects they may have on business and economic growth. These issues can come from agencies, stakeholders, elected officials, the business community, decision makers, or the general public. MTJ Roundabout Engineering’s Mark Johnson has 20 years of experience communicating technical information about roundabouts in an easily understood manner that has proven very effective for successful project implementation. Mark’s easily understood presentation materials and teaching methods address the concerns associated with modern roundabout projects through understanding, transparency, and sharing of knowledge. Featured below are two MTJ public events – a workshop and design charrette that included an afternoon of site visits in the Burlington, Vermont community; and a keynote presentation at the 2015 Region Transportation Summit in Toledo, Ohio. 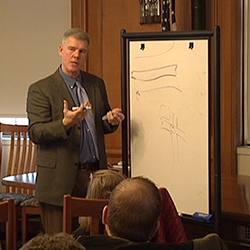 The one-day workshop, titled “Embrace the Roundabout,” was held March 31st at the University of Vermont in Burlington. The event drew decision makers from city government, engineers, and interested citizens. Mark Johnson led a tour of local intersections and discussed opportunities and challenges of roundabouts in those locations. Read in-depth coverage of this successful workshop by the reporter who attended the workshop here. This MTJ roundabout workshop was “so well received by the community” that the City of Burlington is taking the “next steps” and is beginning a planning process for several of its intersections. 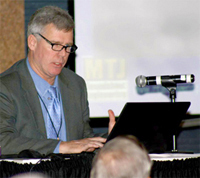 Mark Johnson was the keynote speaker at the 2015 Region Transportation Summit, hosted by the Toledo Metropolitan Area Council of Governments on March 20th. Mark’s presentation provided a comprehensive look at roundabouts – where they work, how they work, and how to build public support for them. The annual Region Transportation Summit provides a forum for discussing the transportation needs of northwest Ohio and southeast Michigan region. Wow! I wasn't expecting this, but I'll take it. Mark, thanks for your help in getting us to this point. The feedback I'm getting is that your presentation is very critical in selling this. I'm expecting letters of support to come from Chippewa Co., Town of Eagle Point, and Chippewa Co. Traffic Safety Commission by the end of Sept. Then, I expect to apply for HES funding. I would have never expected for this to go as well as it has. The mayor of Watertown mentioned what an outstanding job Mark Johnson did on the project--not only great work but he mentioned they were always professional even when the public wasn't! Thanks again for your wonderful presentations skills, hard work, participation and support. I look forward to working with you on the final landscaping plans and the detour situation as you progress through final design. I counted about 90 people in attendance, and one of our neighborhood leaders said it was closer to 100. The vote we took on the roundabout was unanimous (1 person preferred traffic signals) when we took a show of hands. Mark's presentation style is excellent! The people at this meeting were local officials, City and County staff and several developers. Mark was able to explain the concept without using too much transportation engineer jargon. The meeting yesterday was regarding an interchange that we are planning to construct on the edge of Hudson. The City of Hudson officials were so impressed with the presentation and concept that they want to reconsider several improvements they have planned on City streets.